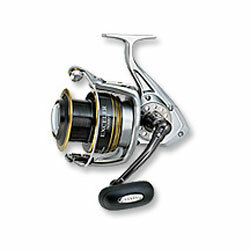 Many top-of-the-line features from Daiwa’s premier reels, but at a superb value price. The all-metal body and frame resist flexing under duress, helping to maintain perfect alignment for the DigiGear gearing. The six-ball-bearing system includes one CRBB bearing for key corrosion protection. Manual bail trip with rotor brake; TwistBuster 2 roller system; dual full-time anti-reverse; machined aluminum handle. Left/Right-hand retrieve.